Locksmiths in Scunthorpe - Locksmiths Advice and Lock identification. When purchasing a Mortice lock this will come with 2 keys as standard. All window must be lockable with a key and working. This included window handles and sash locks. UPVC Doors have no requirements set by most insurance standards as of yet. But we only fit a minimum of Anti snap locks here at LockForce. If you’re ever in doubt of whom is carrying out work for you ask to see their qualifications / DBS Check / Insurance details. If they cannot or will not ask them to leave. All vetted locksmiths will always carry this information on them as we understand we are working in your Home or Business. Sometimes this may even be after a break in. If you are worried someone has the keys to your property and they shouldn’t call the police on 101 and get your locks changed by a vetted locksmith. I would always recommend finding all tradesmen on CheckaTrade.com as these company check all of their advertising companies are DBS checked, Qualified, Have a registered address, Have relevant insurance and Reviews them. Euro Cylinder identified by the shape of the lock. These are commonly fitted into MPL’s in both UPVC door and composite doors. But can also be found in some Mortice locks in wooded doors. These are now the most common house hold lock in the UK. Although these all appear the same from the front there are many standards. Standard Euro Cylinder, Anti snap locks, British Standards locks in 3 levels of security TS007 1 star, 2 star and 3 star. Currently a TS007 3 Star is the highest rating of Euro cylinder lock.) Euro Cylinders work by the pin being alinged into place by the correct key upon insertion then the cam the part in the middle of the lock will rotate allowing the lock to disengage the locking system in the MPL or mortice lock. There is also a oval cylinder the only difference is the shape is an oval surposed to the common euro cylinder shape. Mortice locks these are found in wooden door as from the outside the key hole is the best for of identification. There are two common types of mortice locks a sash lock and a dead lock the main difference being a sash lock retains the door then the lock is not engaged (The bolt is extended) and a handle is used to open the door. A dead lock use solely a bolt which is engaged when the key is turned. 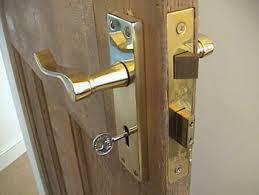 Mortice locks are required to be British standard by insurance company’s. This standard is normally BS3621 this can be identified by the British standard kite mark on the face plate (Where the bolt and sash come out of the door. Normally a brass or chrome plate). 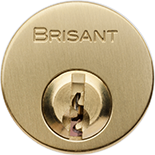 British standard mortice locks are normally 5 leavers when the key is inserted these align then a curtain within the lock is allowed to spin then the bolt is retracted. Night latch these are commonly missed call by the common brand a Yale lock. The lock from the exterior is identified commonly by the round lock face (rim cylinder). These locks are used for additional security and multiple occupancy households. These again are most common on wooden doors, they work by when the door is closed the latch catches in the keep attached to the frame. Meaning there is no need to physically turn a key to lock the door. 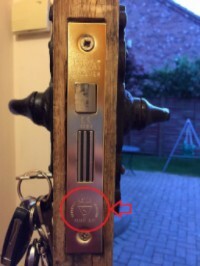 Benefits to this type of lock are they can be open from the inside easily without a key (on non-British standard locks) allow easy exit if multiple people are inside the property. Down side are unless British standard you then need a British standard lock as well on the door for insurance purposes (unless interior doors have additional locks). Also if you shut the door and leave the keys inside you are locked out of your property. The principle of these locks to open is the same as the Euro cylinder where the key moves the pins into alignment but then instead of moving a cam in moves a Shaft the turn the night latch mechanism therefor opening the door.